Summer is a time for cool, refreshing desserts. Xi mi lu is a popular Asian dessert commonly served after dinner at restaurants, and it is suuuper easy to make. The only difficult part is waiting for the damn thing to cool enough to count as “refreshing”. I burned about fifty layers of skin off the roof of my mouth by tasting it as it cooked. PSA: Coconut milk fresh off the stove is Very Hot. Cook the tapioca. The original recipe says to boil water, turn off the heat, add the tapioca, and cover for 20 minutes. Reboil, turn off heat, and cover for 10 minutes. This doesn’t make any sense to me because when you cook tapioca, you have to stir constantly to make sure the pearls don’t stick to each other. However, I followed the directions blindly and ended up with a solid block of tapioca. I spent the next hour or so trying to separate the pearls. Go Christine. You’re a smart one. Also, I don’t know why my tapioca is green. Cook the tapioca. Bring about 3 cups of water to a boil and reduce to medium heat. Add the tapioca and cook for about 10 minutes, stirring constantly. The pearls should turn clear when they’re cooked, with no opaque white dots in the middle. 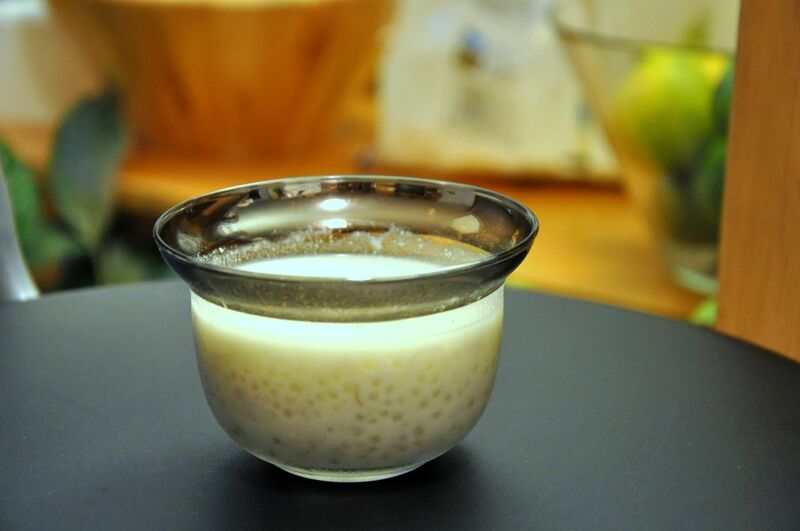 Cooked tapioca is slightly chewy (or “QQ”), neither hard nor mushy. 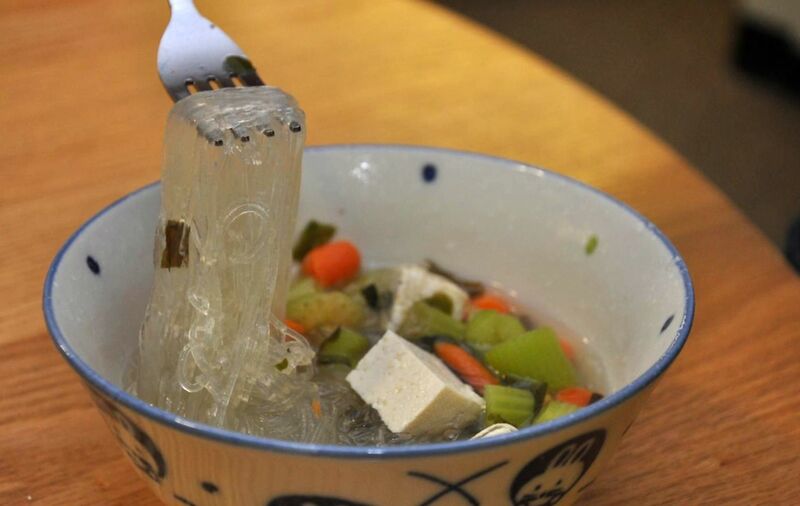 Immediately drain and transfer to a bowl of cold water to stop the cooking. Now, taro is a PAIN to work with. They’re tough little buggers to peel, and bleed starch all over your hands. Do you best to cut them into 1cm cubes. Toss them into a pot with the coconut milk and bring to a simmer. Add the sugar and cover, stirring occasionally until taro becomes soft, about 30 minutes. Remove from heat and chill in the refrigerator. When ready to eat, drain the tapioca again and add to the taro/coconut milk soup. Mix and serve. Length of Procrastination: 50 minutes of hands-on time, forever and a half to chill. 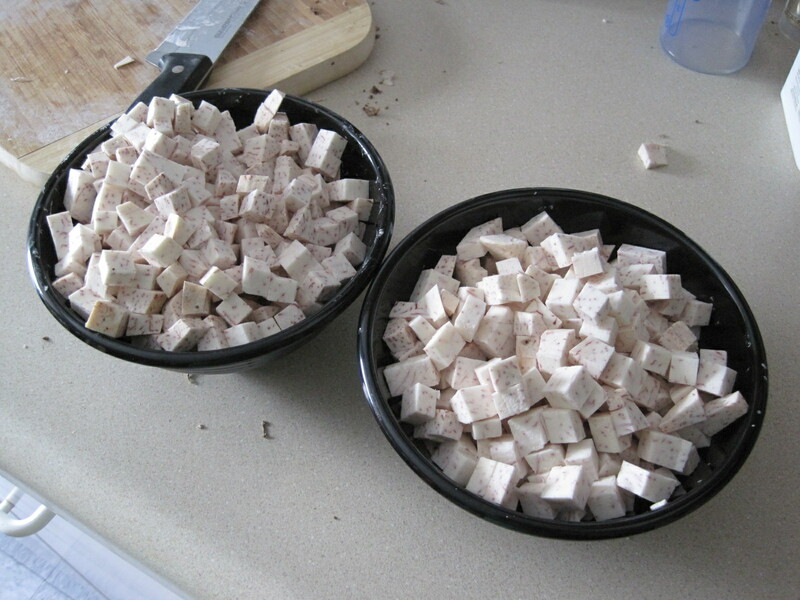 Ways to Prolong Procrastination: Cook the tapioca wrongly and spend forever trying to separate the chunks. Let me be honest–I’ve never made dumplings in my life. In my twenty-one years, never have I sat down next to my mommy and helped her wrap the scrumptious, intricate crescents. Last weekend, after the Fourth of July madness, some of my ATS lovelies came over to help me wrap my very first dumplings. If you’re going to make dumplings, I highly encourage you to do it with friends. It involves a lot of washing and shredding and dicing, which may drive the average person insane. The logical solution is to get someone else to do it. Also, it takes five people one-fifth of the time to wrap nearly a 89 dumplings as it takes one person. From Angela, Stephie, Tiffy, Zach, and me. 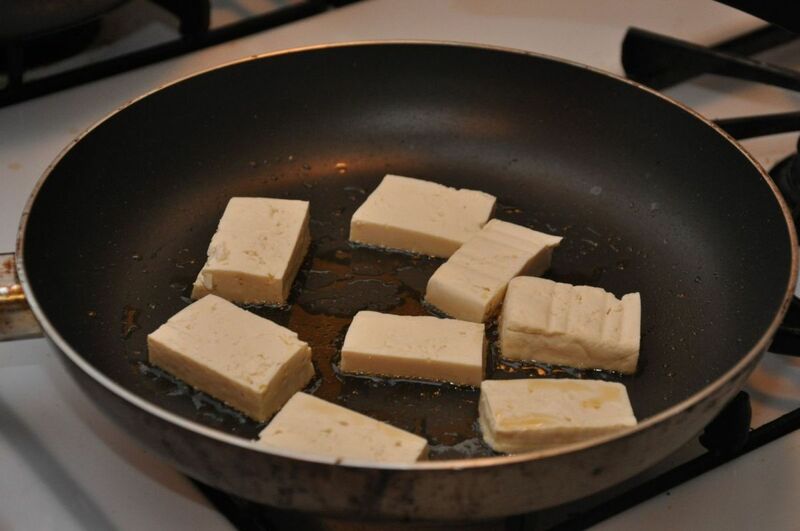 Smash the tofu with the flat side of your Asian butcher knife until it looks like cottage cheese. Set aside. Wash and shred the napa cabbage. Avoid the small bitter leaves in the middle of the head. Toss the shreds with salt to remove the excess water and set aside to drain. Beat the eggs and fry over a large skillet to create thin pancakes of egg. Shred into pieces about 2 inches long and set aside. Remove the stems of the shiitake mushrooms and dice. Set aside. 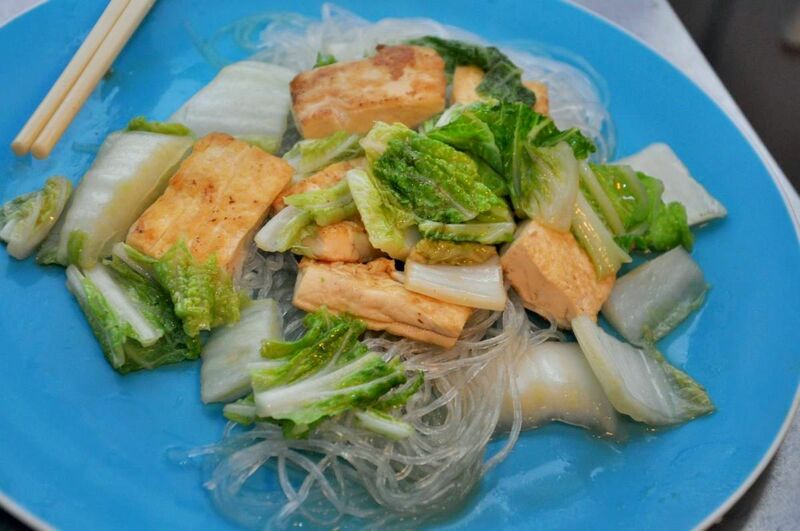 Cut the vermicelli into short strands, at most 2 inches in length. Shorter strands will be easier to wrap, but if they’re too short, the strands will turn into mush. Not tasty. 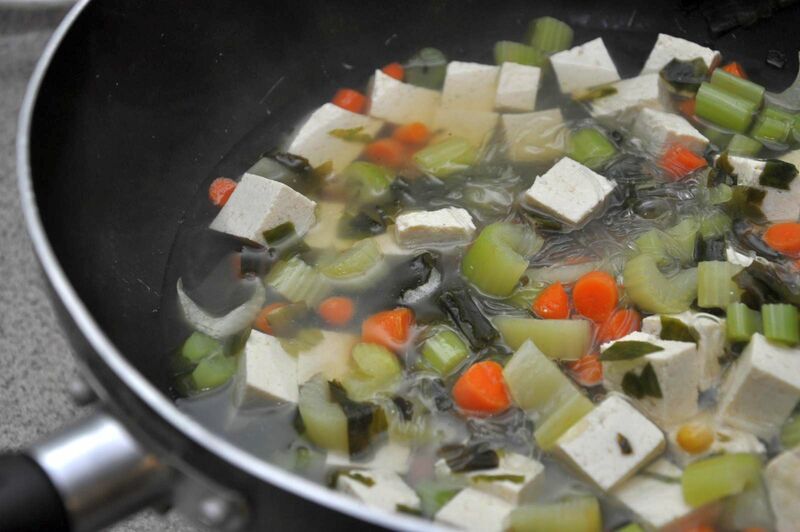 Take all of the shredded and diced ingredients that you set aside and dump them into the smushed tofu. Thoroughly combine. 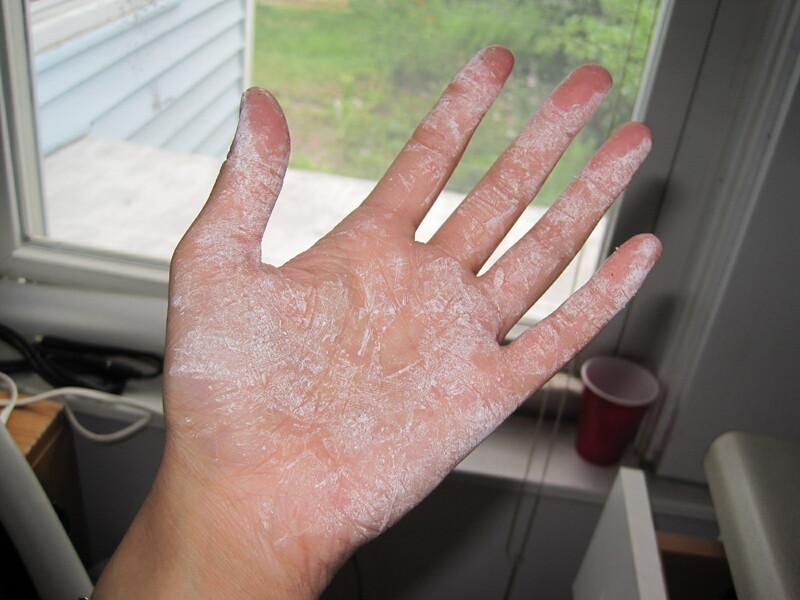 Don’t be a wuss–use your hands! At this point, you can add a little white pepper and salt to season the filling, but most people will be eating dumplings with soy sauce, which adds a significant amount of salty flavor. Now it’s time to wrap the dumplings. There are tons of different ways of wrapping them–you can just seal the edges together or pleat one edge. It takes some practice and a lot of patience to create a nice, pleated dumpling. When wrapping, keep in mind that any air in the middle of the wrapped dumplings will expand in the heat and give you a funny-looking bloated dumpling. No worries; you can just squeeze the air out with a spoon as you cook them, and the taste isn’t compromised. You may want to flour the plate or aluminum foil you’re placing the folded dumplings on so that they won’t stick to the surface. 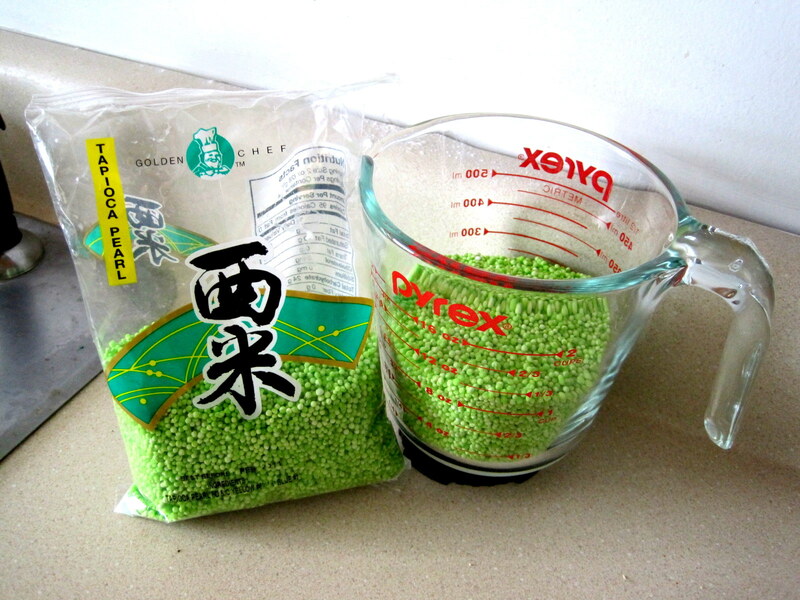 Bring a pot of water to a boil and add a drop of sesame oil so that the dumplings don’t stick to each other. Add the dumplings and wait for the water to boil again. 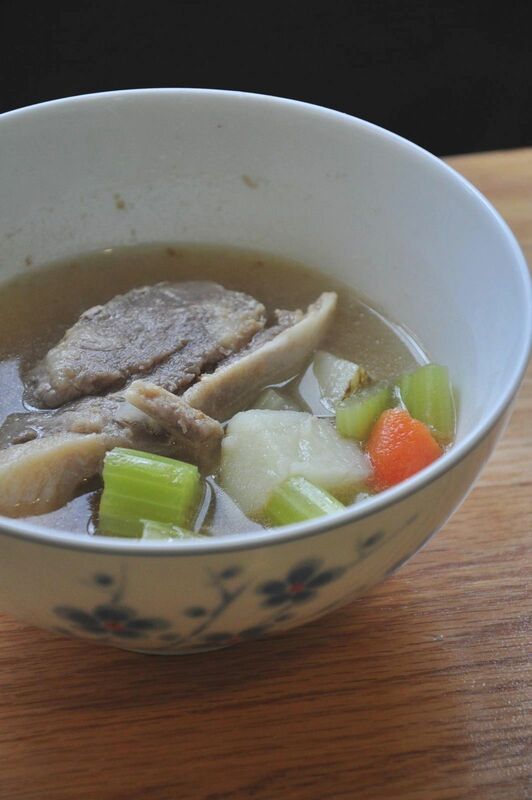 Reduce the heat to a simmer and cook for another 5 minutes or so, until the skin becomes soft and not too chewy. Any leftover dumplings can be frozen in a ziploc bag for about a week. in preparation for the Columbia taekwondo tournament, many people are probably cutting weight and eating very little. here’s a way to kick the boredom of your old salad and put some spice into that leftover head of lettuce. 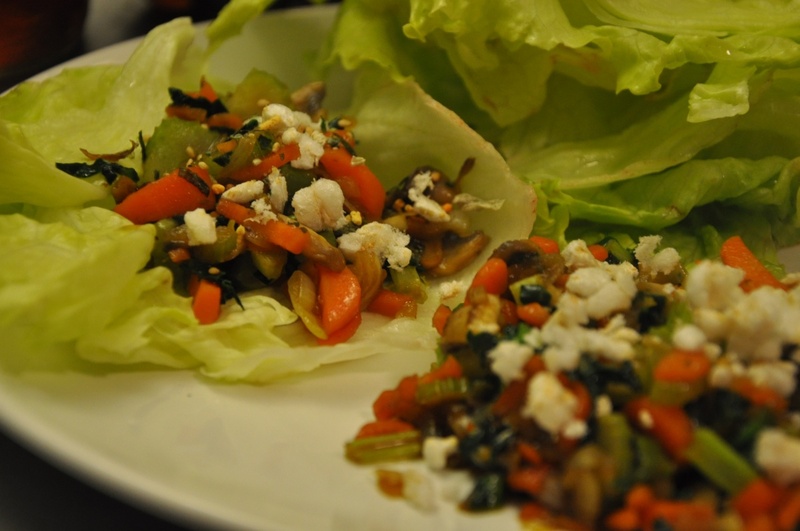 or, you could just make these lettuce wraps because they’re so damn tasty. p.f. chang’s got nothing on us! 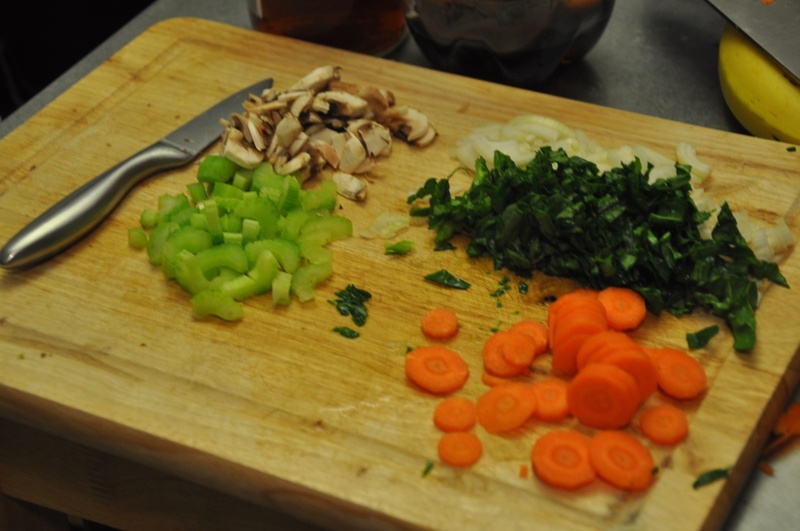 Dice the carrot, celery, mushrooms and onion. The pieces should be small but can still be chunky for texture. Crush and dice the garlic. In a sautee pan, heat olive oil and brown the garlic, then add the carrot and celery Sautee until the ingredients are starting to soften, and add the mushroom and onion. Add soy sauce and sesame oil to coat all the ingredients. Cook until onion is caramelized. If making chicken lettuce wraps, cut the chicken breast into chunks, and cook in olive oil. Add sesame oil, soy sauce, and salt and pepper to taste. After chicken is thoroughly cooked, remove from heat, and on a chopping board, further cut the chicken into small chunks. Mix in with the vegetable ingredients. Crush the rice cake using a spoon in a bowl, or just using your hands. Arrange the lettuce wraps. 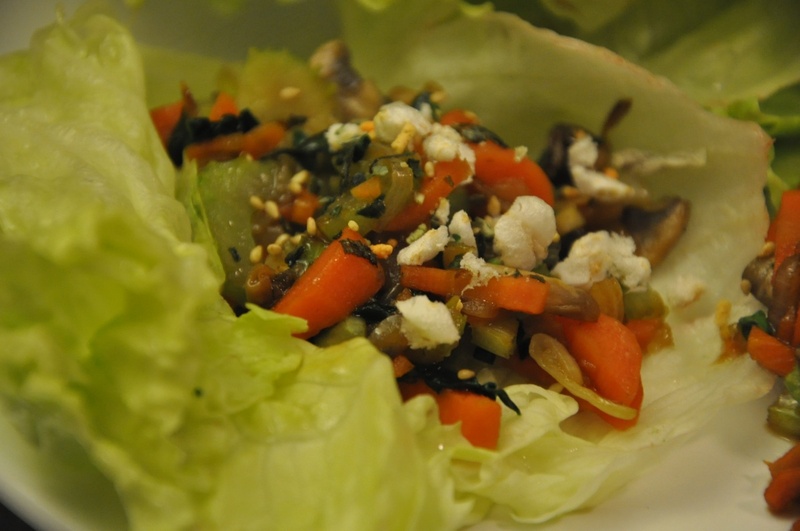 For each wrap, spoon out some filling into the middle of a large (contiguous) piece of lettuce. 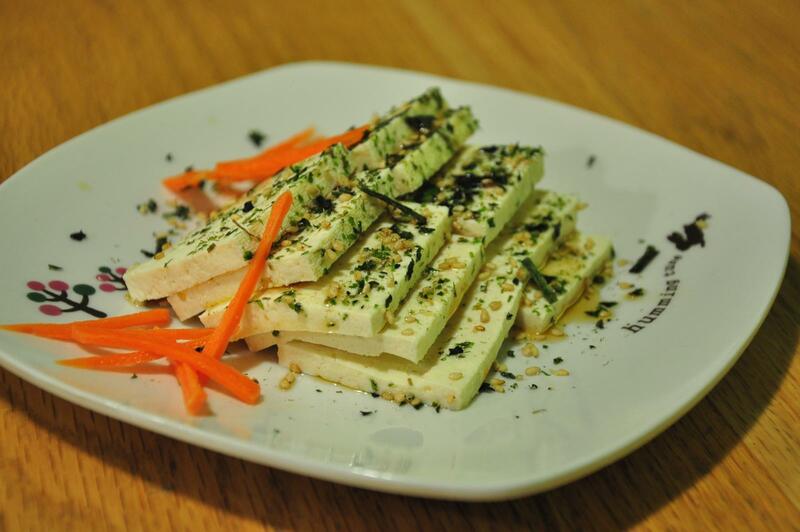 Sprinkle rice cake crumble and furikake on top, wrap, and enjoy.